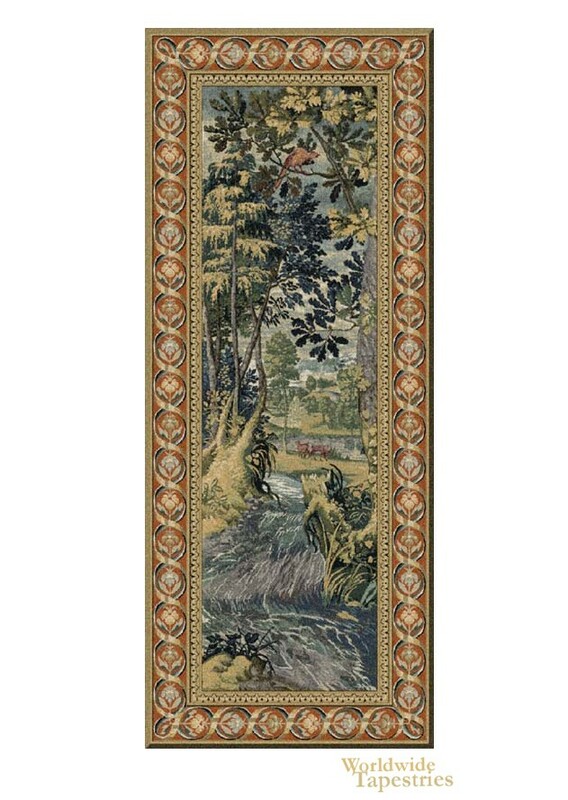 Part of “The Jagaloon Tapestries” collection, which consisted of “Woody” along with The Forest, Iris, Timberland, Wooden Hills, Underwood and Woodland, this Woody tapestry was originally woven in the mid 16th century. It was commissioned by the King of Poland, and today, “Woody” can be seen in the castle at Wawel in Krakow. A portiere, the tapestry was originally designed to hang in an open doorway or cover a window to keep drafts out, hence their long rectangular shape. “Woody” is a spectacular example of the classic portiere. It is rich in detail, showing a rushing stream weaving through a wooded glen. To add depth, the middle ground includes some animals. A bird in the tree ties the whole landscape together. Woody tapestry is lined and has a tunnel for ease of hanging. Note: tapestry rod, where pictured, is not included in the price.